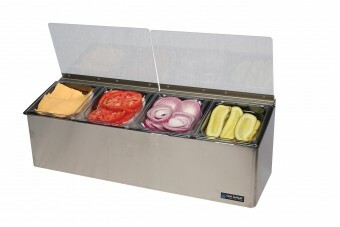 EZ–Chill™ Self-Service Centers keep condiments chilled and easy to access. Designed for use with our refreezable EZ-Chill™ Ice Packs, these centers feature ice liners that also allow for use with ice. Hinged "Flex-Lids" can be adjusted to rest at different positions and will not rust. Interchangeable pint and quart trays allow you to easily change configuration as needed. Available with or without notched lids. Tongs are not included.